I am still having a hard time concentrating, so the writing part of me is in hibernation. But, I did pull this guy out today. Haven’t played since the end of October. I played scales with fingers, slap, and pick. Felt good to have it in my hands again. This is my Friday break from writing, editing, synopsising, platforming, …ing and focus on my other love…bass guitars. For some players, this is the holy grail of bass goodness. Especially for progressive rock bassists. I used to own one. WHYYYyyyy! The 4001 is brutally awesome in songs like “Sober” by Tool, “Closer to the Heart” by Rush, “Close to the Edge” by Yes, “Orion” by Metallica. Any Beatles song when Paul wasn’t playing his Hofner violin bass. The Ricky is an all maple masterpiece, heavy masterpiece. Match this bass with a 70’s Ampeg SVT and an 8×10 cabinet and you will be able to cause destruction to china cabinets and hearing loss to small woodland creatures. This is not meant to be an all inclusive history of the Rick post. That…That would take a book. And an author. And…no, not going to write it. Take some time today and spin a song that has one of your favorite Rick players. Your world will be a better place. Here’s a shortened list of cool Rick players. Hope you enjoyed the bass of the week. Have you ever wondered about the bass tone in Rage Against the Machine’s “Bulls on Parade”? Yes? Great, I understand. Because you wanted to know, I’ve included a signal chain used by RATM bass player Tim Commerford. 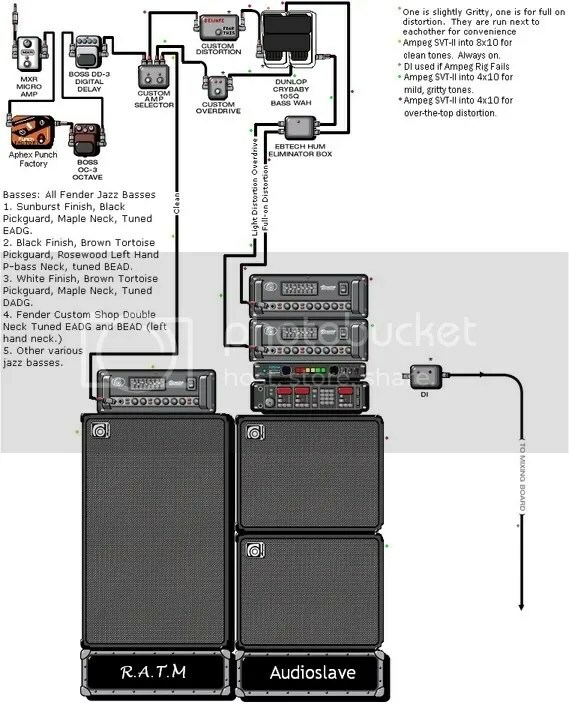 This is not the whole secret to his tone, but a nice setup for sure! I don’t have my first bass anymore. I think this looks like mine. I must have been 12? I don’t remember. My parents (who were awesome) allowed me (bought me) a bass guitar. What was the first song I “learned”. It was the 70’s. What song did every kid learn first in the 70’s. “Smoke on the Water”. I never did play it correctly, but boy did I ever duhn duhn duhn, duhn duhn, dun dun, thousands of times. Ah…those were the days. What? You mean you’ve never heard “We all came out to Montreux, On the Lake Geneva shoreline”; “Smoke on the water, fire in the sky”. These strings are stainless steel and wound tightly. They feel good on your right hand when plucking or thumping (or left if you are a lefty). I love them. I used to play Rotosounds, but they die soooo quickly. The DRs have a long life and look mahvelous. Peavey T-40. Mmmm. I have one just like this (except mine has staining from use). These 4-stringers are heavy. And I mean eighch double ee vee wai, heeeeveee. You can easily slay small woodland creatures with one swing from this axe. Possibly even mid to large sized, but that’s a different post. The pickups have some really cool, powerful wiring. You’ll have to look in the manual, I forgot. Sorry already. But, seriously, play this gal (or guy) with a pick and you will get some aggressive tones (roundwounds required). I’ve also played my darlin with flats and she was more sultry. Still sounded great. It does have a massive bridge like a Rickey. It also has a metal nut. Metal. Nice. The best part about this bass guitar is that you can pick one up for under $500 on used.guitarcenter.com or ripoffbay. This was Fingerstyle Friday. Keep Thumpin! So, as a Friday celebration feature I will start posting pictures and tributes to my favorite basses. Today, the 1951 Fender Precision “p” Bass. Sometimes called a “Tele” bass because the headstock matches the telecaster guitar. The bass is a slab style with a single pickup. I’ve only played a reissue (like the one pictured) but enjoyed its unique sound. 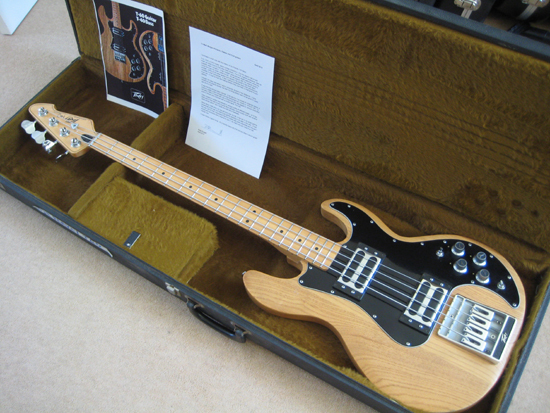 One of the famous players of the 1951 fender precision is Sting from The Police.